FC Barcelona have the deadliest pair of strikers in Europe. 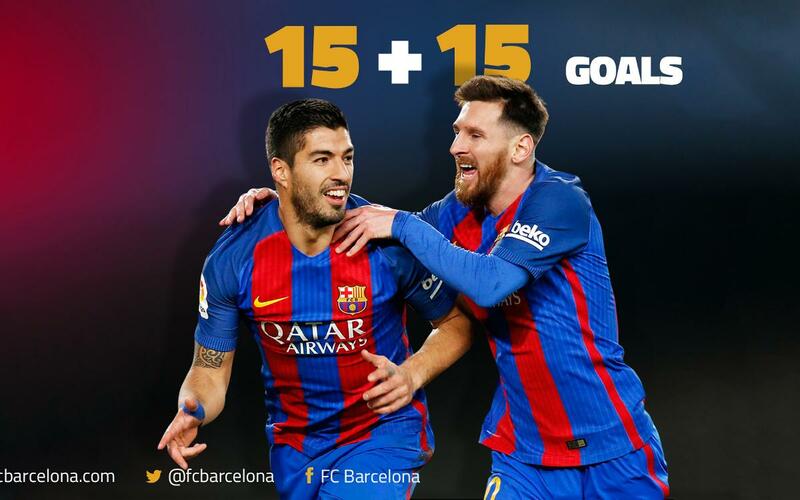 The 30 goals scored by Luis Suárez and Leo Messi in the first half of this season, with fifteen each, makes the Barça tandem the highest scoring in Europe’s top leagues. The two players’ scoring records aren’t limited to their exploits in LaLiga, with Suárez adding another four in other competitions and Messi adding thirteen more to his league tally. The Argentinian star has scored an incredible ten goals in the Champions League as well as two in the Copa and one in the Spanish Supercup, giving him a total of 28 goals so far this season. Behind the blaugranas we have Cavani and Lucas Moura who are scoring freely for Barça’s next Champions League opponent, PSG. Together they have scored 26 goals leaving them four behind the Barça pair, with Cavani weighing in with an impressive twenty of them. In third place, there is a tie between Chelsea duo Diego Costa and Eden Hazard, with 15 and nine respectively; and Tottenham’s top scorers Kane and Delle Alli, with thirteen and eleven. Next up we have Arsenal with 23 and then Inter Milan, Roma, Torino and Olympique de Lyon tied on 22. The top 10 is completed by Borussia Dortmund and Napoli. Below you’ll find the full table of Europe’s most fearsome attacking partnerships.